I had an exhibition of my art on Saturday. This photo shows how I was doing a mock planning to see which paintings I would take with me. Many of them I have done quite a few years ago. There is a collection of rose paintings ..and an Italian scene with poppies… A countryside kitchen with a jug of daisies. A mother and child connection. A woman running on an open daisy field. ….a table set in a garden of flowers…. 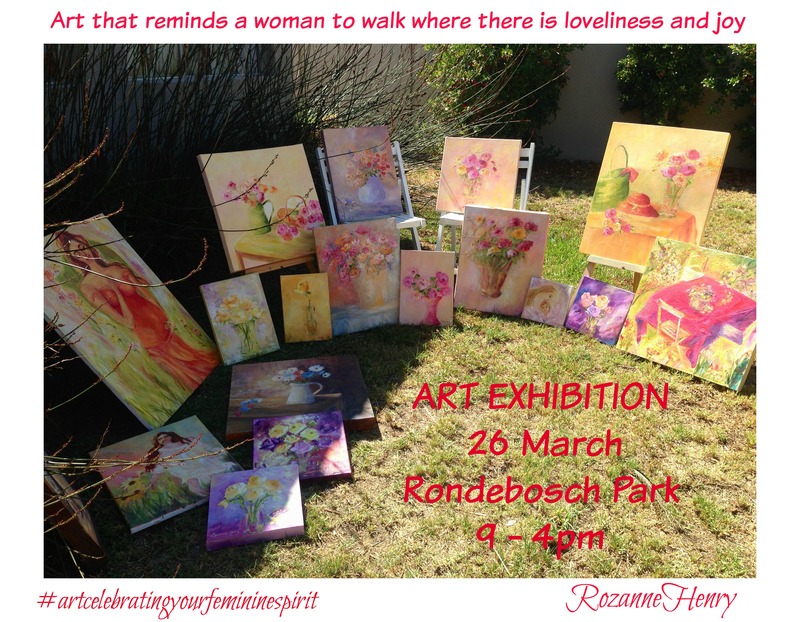 I am parting with every painting I have held dear for years on my walls in my own home because I’m witnessing the sheer delight when a painting finds a wonderful home in another woman’s heart and home.. as happened last week when I delivered 2 paintings. 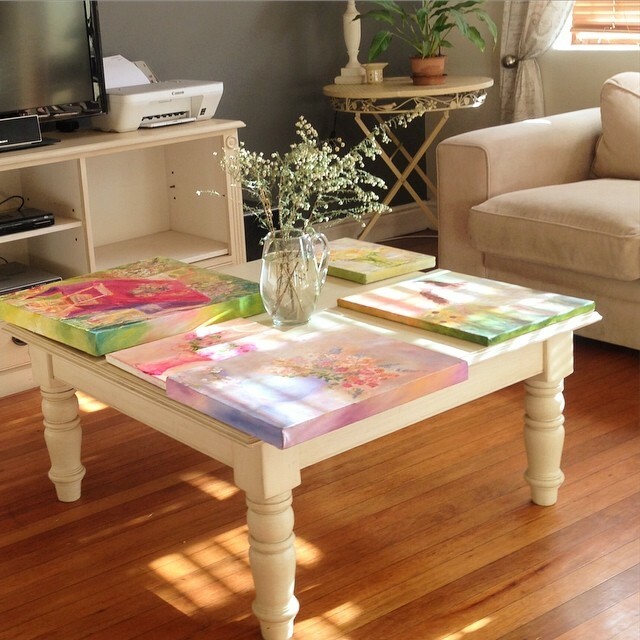 ….and then the next morning, I entered my lounge and this gorgeous morning light across my paintings captivated me. I had touched up the sides of the artwork and left them here to dry for my exhibition. I love sharing an uplifting moment no matter how simple. They transform the ordinary into the magical…. 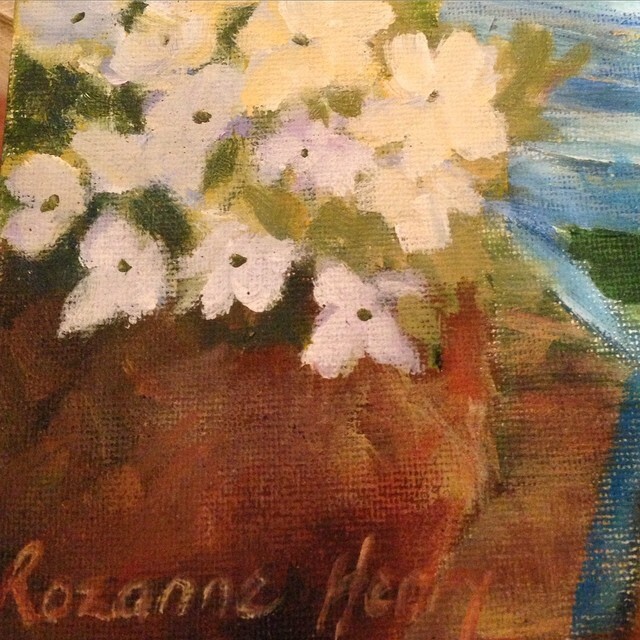 As I repainted my name on this old painting, a beautiful memory came flooding back to me. The day I painted this my sons were playing around me, my easel set up in the garden. There is another image of this further below in this post. 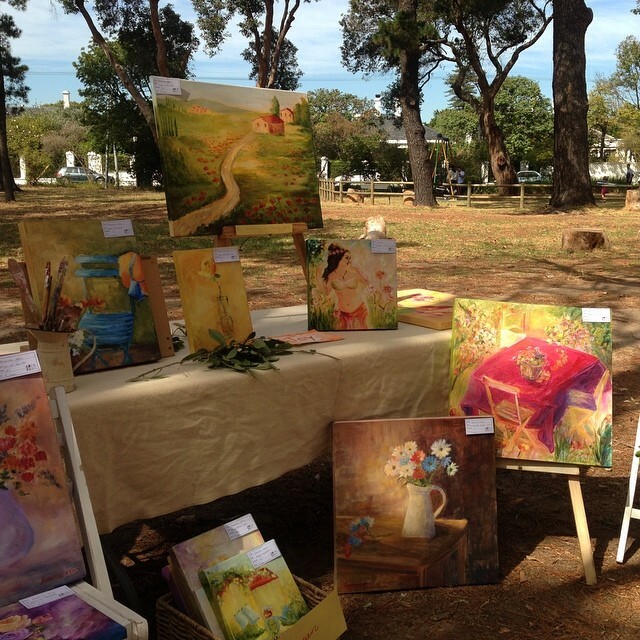 This was taken later during the day when the light was so beautiful across my paintings. There were so many rewarding moments to the day. Artists arrived as strangers nervously unpacking our paintings. We left feeling as kindred spirits with each others phone numbers. 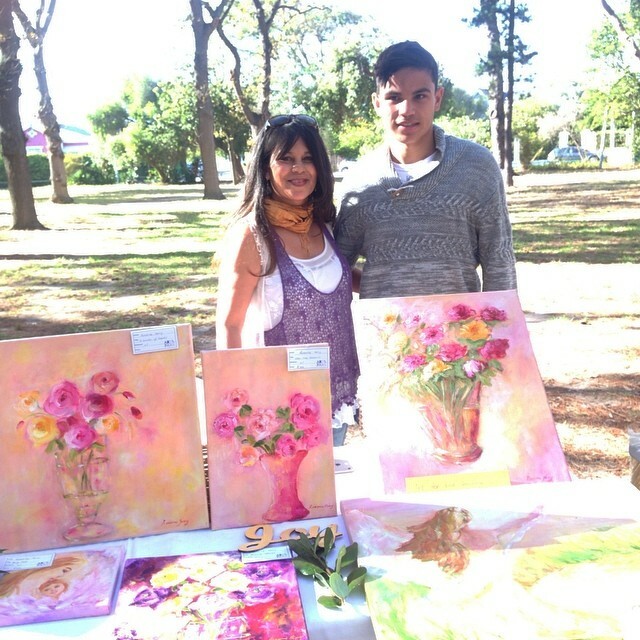 I photographed the lady next to my stand selling her first painting ever, so she can have that memory forever… I met women who desire to paint with me… and learn to connect intuitively with colour…. It was such a lovely day. I was so grateful too for Cape Town friends who came to say hello, laugh and chat. I have not shared many of these in my shop or on my Paintings page. I have had requests from followers who have seen my posts on Instagram, who are interested, so please feel free to contact me if you see something that you are feeling drawn to and I will send you more information.